Haute couture Fashion is constructed by hand from start to finish, made from high quality, expensive, often unusual fabric and sewn with extreme attention to detail and finished by the most experienced and capable sewers, often using time-consuming, hand-executed techniques. Couture translates literally from French as “dressmaking”, but may also refer to fashion, sewing, or needlework. Haute translates literally to “high”. A haute couture garment is often made for a client, tailored specifically for the wearer’s measurements and body stance. The term originally referred to Englishman Charles Frederick Worth’s work, produced in Paris in the mid-nineteenth century. In modern France, haute couture is a protected name that can be used only by firms that meet certain well-defined standards. In 1864, at the full height of his success, Worth reformed the the crinoline. The crinoline was growing increasingly larger in size, making it difficult for women to do even the most basic activities, such as walking through doors, sitting, caring for their children, or holding hands. So he designed a narrower and more practical silhouette for women which gravitated the largest part to the back, freeing up a woman’s front and sides. Worth’s new crinoline was a wide success. Eventually, Worth abandoned the crinoline altogether, creating a straight skirt. Have a workshop (atelier) in Paris that employs at least fifteen staff members full-time. Must have twenty, full-time technical people in at least one workshop (atelier). Every season, present a collection of at least fifty original designs to the public, both day and evening garments, in January and July of each year. Beside official members, the Chambre syndicale officially “invites” each season some “guests”. 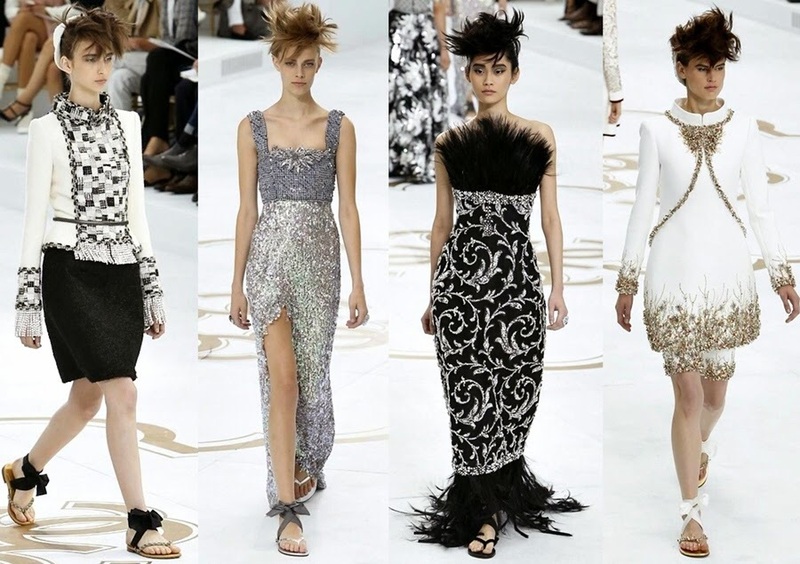 They cannot use the term “haute couture” but only the term “couture” and can become grands couturiers after 2 years. The Channel 2015 Spring/Summer collection seem to have gone back to basic colors of white, gold, black and grey and the form seems to be less form fitting and rather stiff in form. One item I was glad to see is more flat sole shoes. It seems that one of Charles Worths intentions was to free women from the confines of their clothing and so I am glad to see a designer focusing more on the practical needs of women. Suzi!! The blog is great….. I’m so jealous, hope you guys are loving the trip 🙂 I’m still watching!! !